This will hopefully sell amazingly well as I would like to see some improvements made in the career mode for the next UFC game, but will the control system prove to complex for the average gamer and put them off? I really hope not, as if you give this the time it deserves, it can be a very enjoyable game." See UFC 2009: Undisputed Review (XBOX360/PS3) for the full article. What have THQ got instore for us this time around? Well, first up is the cover star. 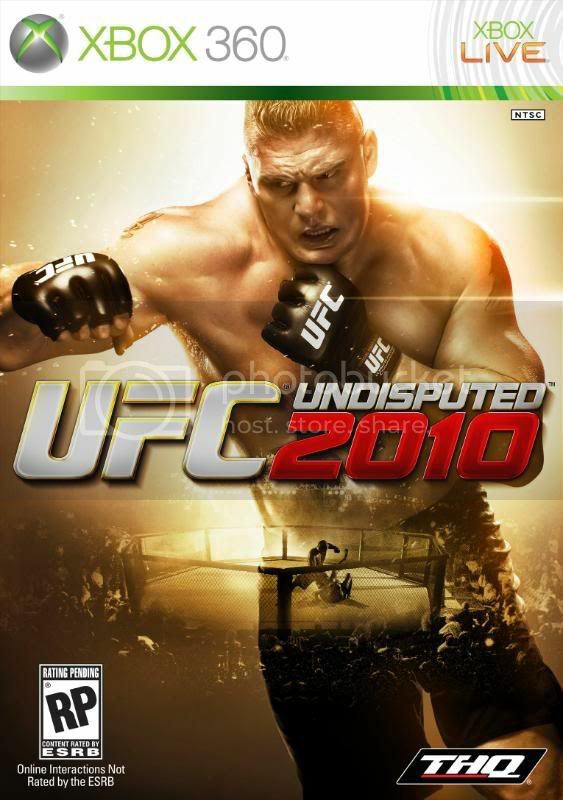 Brock Lesnar will be on the cover of UFC Undisputed 2010. Brock Lesnar made his UFC debut at UFC:81. A former amateur and professional wrestler, as well as a mixed martial artist, he went on to win the UFC Heavyweight Championship by defeating Randy Couture at UFC:91 on 15 November 2008. Lets see what 2010 has to offer shall we?? Last year, UFC Undisputed 2009, had over 80 life-like fighters. This year they have gone and upped the ante and decided to include over 100. THQ state 'Fighters & Personalities'. Does this mean realistic ring entrances and fighter interaction (more on that later)? My comments on UFC2009's graphical quality said it all, "They really are photo realistic: blood, sweat (and probably tears) have been recreated with such quality and precision its quite an achievement", and to be quite honest, it seems to have improved again. The most impressive part of the character models had to be the physical presence of the fighters, every swung punch and kick meant something, whether it was blocked or hit squarely on the chin, you saw and felt that impact. Encounter too many kicks to your legs my friend, and you were limping. That is only the tip of the ice berg when it comes to UFC2009's fight mechanics and guess what, they've gone and added a whole new layer. This time around the guys and dolls behind UFC2010, have added two new fight mechanics to make it all the more realistic. The 'Sway System'. This allows for some free flowing counter attacks, with full upper body and head movement to keep out of the way of incoming attacks and turn them against your opponent. Also introduced, is the new 'Posture System'. This addition allows for some fight ending strikes where ever you are on the ground. And to add even more realism, they have decided to add the 'South Paw' stance, to make your custom fighter even more like you (if you're a south paw, that is!). The customisation was, to say the least, exceptional in 2009. In 2010 even more fight styles have been added to your répertoire; Sambo, Karate and Greco-Roman Wrestling. Alas, no word on putting your face into the game via XboxLive Vision Cam or the PS3 EYE cam. In my opinion this would have been an awesome feature as with the already amazing character models, seeing my face and my mates on screen getting the living hell battered out of us, would have been hugely entertaining. In regards to the online component, I cannot wait until this is released as a certain UFC rival of mine, Nicky Sensei, is in dire need of a rematch. UFC2009 started off well, hardly any lag and quite a well rounded ranking system as well as player matches that were enjoyable. Unfortunately that didn't last long for me, but that may be due to my overpriced internet provider not coming through on their promise of a stable connection. This year, the online side of things have been given a complete overhaul. You now have the ability to form fight camps and leagues so that you and your friends can compete against and train with each other. WOW. I never expected this, at all. I'm surprised, horrified, pleased and jumping for joy all at the same time. If this can be pulled off, it will be the ULTIMATE online fighting game. That's not all! The career mode in UFC2009 was ..... lacking really. It had a very surgical feel to it and never had much interaction other than the fights. Its all changed now. With the new feature 'Game Is watching You', tracks every action and uses this information influence ingame commentary, you opponents intelligence and your overall career progression. There has been no talk of ring entrances, but with the inclusion of interactive weigh-ins and interviews, that affect your popularity and cred, I'm hopeful they are also incorporated. The new career mode also has online co-op sparring. Again, WOW. The guys at Yukes and THQ, have brought to life some amazing ideas. Now lets just hope that it all works smoothly. Its definitely looking to be the most immersive fighting experience you will come across. If UFC2009 blew EA's FNR4 out of the water, I have no idea what EA's MMA is going to look like after UFC2010 has had a go at it. Keep an eye on www.righteousreviews.com for the inbound review.